Since inception, Microsoft Dynamics CRM has been dedicated to creating a seamless customer experience and encouraging customer engagement through an impeccable service-oriented sales approach. But, in today’s digital world, the interactions are way too high to get the attention of customer easily. But, Microsoft Dynamics 365 has transformed the way interactions work. It is the best solution for organizations to get a lot more at a convincing price. This is a great cloud option, which offers a wide range of amazing new licensing options. Take the first step towards a future-proof business by simply transitioning some of your existing Dynamics licenses to 365. With the cloud, you can start where you want and scale into the features and named users you’ll need. With the next step, you can easily and reasonably step into a new intelligent, cloud-based solution. Together, Dynamics 365 and the Microsoft cloud offer everything you need to run a future-proof business. Dynamics 365 is not just quicker but also more efficient than the previous versions. Its common data model streamlines efficiency, enabling the intelligent use of customer data across platforms. This is a one of its kind solution which breaks down the silos between ERP and CRM. When licensed together, the solutions offer unmatched cost savings and productivity gains. 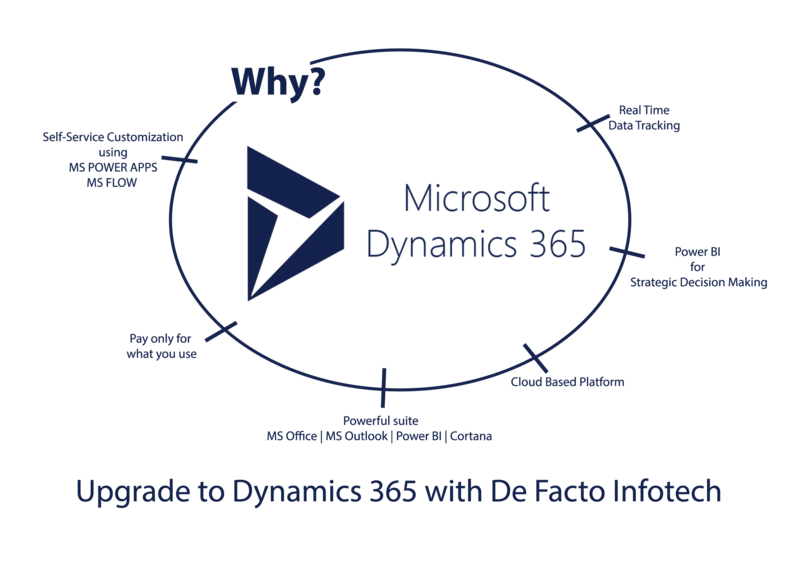 Why Jump to Microsoft Dynamics 365? Transform the way you want: Drive your organization on the right path with modular, multichannel applications that not just work together seamlessly but can also integrate with your existing systems easily. Eliminate silos from business: Give your best shot at work by unifying relationships, processes, and data with the connected cloud and comprehensive business applications of Microsoft. Actionable insights: Microsoft’s leading intelligent technology promises better outcomes with connected data, business analytics, and guidance. The smart insights let you take actions instantly. Future-proof solutions: Accelerate your business growth by extending your existing applications, creating new solutions, and third-party technology integrations on a flexible, scalable, and secure platform. Microsoft brings Dynamics CRM and ERP solutions together with its powerful cloud-enabled product offering- Dynamics 365. The solution is a gamut of applications, including Sales, Field Service, Customer Service, Project Service Automation, Marketing, Retail, Talent, Finance and Operations. Sales: Dynamics 365 for sales empowers salespersons with insights to personalize relationships, predict customer needs, and boost sales. Adobe Marketing Cloud: Dynamics 365 and Adobe come together to digitally transform engagement at every touchpoint in your customer journey. Field Service: Serve customers better through proactive maintenance, predictive scheduling, and first-time fix. Customer Service: Deliver more than expected to your customers. Empower your agents to offer optimized self and assisted support by delivering personalized experiences. Project Service Automation: Deliver customer projects on-time, within budget, and become a trusted advisor. Finance and Operations: Accelerate your business growth with Dynamics 365 for Finance and Operations. Revolutionize your business operations across finance, manufacturing, and supply chain and grow. Retail: Deliver a personalized shopping experience to customers by unifying digital, in-store, and back office operations. Talent: Bring out the best in your people. Attract the right people, hire them and grow your talent. Dynamics 365- Business Application Platform designed for you!! App development just got easier with Microsoft’s Business application development platform. Build your apps on Microsoft Application Platform, and you can run them wherever you want, on premise, in the cloud, or a hybrid of both. The business apps built on this platform can be easily accessed by any client, from a PC, mobile device or browser. It’s time you build apps that give you a competitive edge. The business application platform offers seamless Dynamics 365, Office 365, and Azure integration along with connectors to over 200 data sources, making it easy for anyone familiar with Microsoft Office to start building revolutionary apps. Get your hands on Power BI and PowerApps. PowerBI allows you to gain insights from your data regardless of where it lives, whereas PowerApps enables you to build apps with its point-and-click approach to app design. Build intelligence into your apps. Create an app for every task. What are you waiting for? Build, extend and customize your apps with the Microsoft Business Application Platform. Make the most of Dynamics 365 and Office 365 faster than ever. Get ready to embrace transformation in your business with Dynamics 365.